Germany [ ] coach Joachim Loew hailed his young team's "magnificent" display in a 4-1 World Cup second-round demolition of England on Sunday before explaining exactly how they targeted a suspect English rearguard. 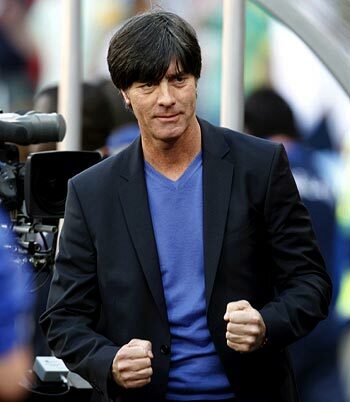 "First of all, we've put on a magnificent display against a very experienced England [ ] side," a deadpan Loew told reporters. "Today we were dominant, we were successful in luring John Terry [ ] out of defence with (Thomas) Mueller and (Lukas) Podolski penetrating the wide defence. "It is a very young team and I am very proud that they coped with the pressure and kept the pressure on England," he added. After an even start to the match, Germany's Miroslav Klose [ ] was gifted an opener after a sloppy England defence failed to deal with a long ball. It quickly got worse for England as the German front-three of Mueller, Klose and Podolski went to work. England centre-backs John Terry and Matthew Upson failed to cope with Germany's pace or movement with Podolski adding a second before Mueller's second half brace. Loew said that was all part of the plan. "We knew that the midfield is (Steven) Gerrard and (Frank) Lampard, who always support the forwards, and that their midfield would be open. "So our objective was to set Terry up with Klose to force him to come out of the defence. We knew that the fullbacks would be very much to the sides and create spaces between the England defenders that would help us penetrate their defence. "We wanted to do this and we were successful there," he explained. With opposing manager Fabio Capello [ ] standing in the background, head bowed and waiting to meet the press, Loew went on to praise the thorn in England's side -- man of the match Mueller. "When it comes to the 18 yard box he is totally cool in hitting home when he has the opportunity. I really love the way he dives into that area and finishes chances off. This is quite impressive, he is only 20," Loew said. England fans raised a cheer when Upson's first half header brought the score to 2-1 and they went crazy seconds later when a Lampard lob beat Germany keeper Manuel Neuer, hit the crossbar, bounced over the line -- only not to be given. "I have to say this ball was across the line, so it should have been given as a goal," Loew said. A business-like Loew quickly switched his attention to a pending quarter-final but played down talk of his side being tournament favourites. "This is a tournament like any other. We, of course, can enjoy this victory but as of tomorrow we have to work hard again," he said before later shaking Capello's hand as he exited.